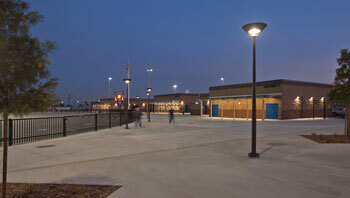 The new sports complex, renovation and expansion of the high school campus main quad for Alta Loma High School was designed by GO Architects of Upland with project management by Tilden-Coil Constructors. The project was photographed during the day and at dusk allowing me to imbue inanimate structures with an aura of life and drama. For the previous 50 years, the Alta Loma High School Braves wandered three stadiums for their home games. Now, they have their own home. . It includes a fully- lighted 5,000 seat full football/ soccer stadium with an artificial-surface track. Outside and adjacent to the main stadium are new fields for baseball and softball. 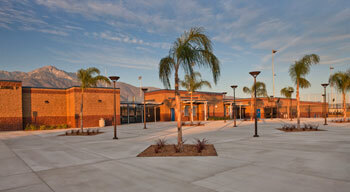 In addition to the athletic complex, the project included the renovation and expansion of the high school campus main quad. The removal of the old pool and surrounding walls expanded the usable area, improving student circulation. The construction of a number of steel shade structures and raised planters provides students comfortable areas during lunch and break periods. A raised platform with dedicated lighting and a small lawn seating created a staging area for student rallies and outdoor performances. Beautiful by design, the restored landscaping is also practical as it is drawn in drought tolerant plants irrigated by water- conserving irrigation systems. It is an honor to share this important rite of passage for the community. Hats-off to GO Architects for the obvious care in which the desires of a community were implemented. Years from now people will look back and wonder how they ever did without.